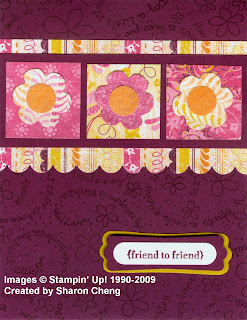 This card uses the new Razzleberry Lemonade paper and Rich Razzleberry and Crushed Curry cardstock. It's a quick card that you can make at our Open House and Retired Stamp sale this Friday, July 10, from 7-9 p.m. at St. Michael's Anglican Church, Richland Hills, 76118. We'll be in the fellowship hall behind the church. Thanks to my Stampin' Up! friends, we'll have over 100 retired stamp sets, paper, inkpads and samples for sale at the Open House. Please come early for the best selection.